Being a Star Wars fan since the dawn of time, there is one thing I always wanted to do… Use the force! Let’s face it, how often at work, school or just about anywhere have you tried to use the “Force”? It’s something ingrained into our brains. With The Force Trainer II, you are the Jedi. Imagine that you could raise an X-wing from the Dagobah swamp just like Luke Skywalker, battle Darth Vader, or build your own lightsaber with just the power of your mind! These magical scenes are re-created through hologram images and a wireless headset with real brainwave sensors that read and interpret your levels of concentration. The more you focus, the more successful you are in using the Force to move and control the hologram image and successfully complete the Jedi challenge. 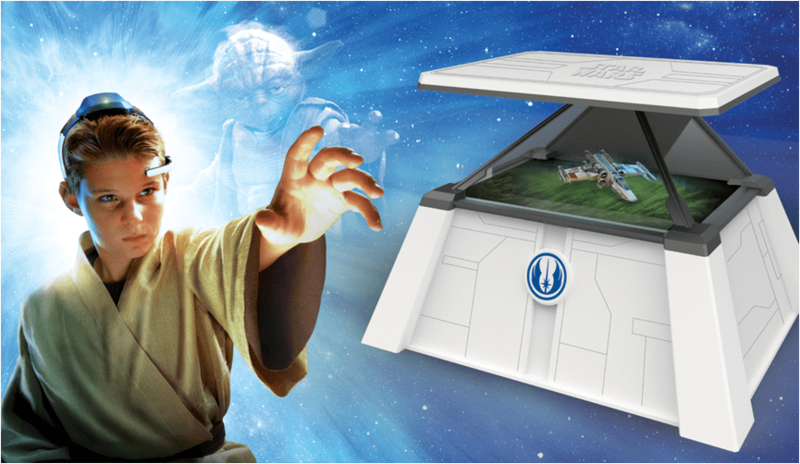 The hologram images and Jedi Challenges come through an exclusive app included with the purchase of the product and powered by the user’s tablet device which projects these holograms into the unique Jedi training base. There are 10 different Jedi Training levels through which fans can advance from Padawan to Jedi Knight to Jedi Master, with instruction and guidance from Jedi Master Yoda. Additional Jedi Challenges will also be available for download on updated versions of the app as new Star Wars movies are released. The product is expected to hit retail stores in Fall, 2015 with an estimated SRP of $119.99.